Are You a Bad Enough Dude to Back a Bad Dudes Sequel? For nearly a quarter century, this video game has posed the ultimate hypothetical question of one's manhood: Let's say, perchance, the head of government of the United States of America is abducted by masked assassins: Do you embody the qualities of a highly motivated, results-driven person who can effect his safe return? If Joe Modzeleski and his Michigan-based Pinstripe Games team can secure the funding for the game they have planned, they won't need that kind of tortured rewrite of the hilarious opening to 1988's Bad Dudes. They already have a licensing agreement in place, with the current rights holder, to develop Bad Dudes 2, the successor to Data East's beat-em-up that has become even more well known as an Internet meme 24 years later. They envision the sequel for PC and Mac release. Kickstarter is full of pie-in-the-sky projects begging for attention, but what grabbed mine about Bad Dudes 2 is not, well, the fact it's a sequel to Bad Dudes, which makes a weekly appearance in the reader submissions to the Kotaku 'Shop Contest. It's the fact that, when I asked Modzeleski if his team already had permission to make this game, or was simply raising money in hopes of getting a license from G-Mode, the Japanese mobile games publisher that owns the title, Modzeleski didn't hesitate in correcting me: "We have the rights to the IP, we have the rights to develop the sequel," he said, "but we will have additional fees once it is released." This is unusual because serious Kickstarter video game projects that reference well known series are typically begun by those who own the rights to the series. Even established enthusiast programmers, like Exploding Rabbit, behind Super Mario Crossover or Dave Murray, trying to make a "Tecmo Bowl MMO," haven't sought official licensing from Nintendo or Tecmo to make fully commercial versions of their ideas, even though they trade heavily on the attachment to those games. They've chosen to pursue more generic concepts instead. (Both still both hit their funding targets). Modzeleski, who himself owns a Bad Dudes Vs. Dragon Ninja cabinet, didn't want to make some game that implied it was Bad Dudes, like my opening paragraph. He wanted to make a Bad Dudes sequel. In One of the Greatest Comebacks in Sports History, Fans Fund "The Tecmo Bowl MMO"
"I love this game, I love how ridiculous it is, and if anyone is going to make a sequel it should be someone that understands the community that enjoys Bad Dudes," Modzeleski told me. "It should be someone who understands why they think its funny, and why it's reached meme-status. I ended up putting together a story that I felt needed to be the sequel, and even though I knew it was well outside the norm for independent developers or for crowd-funding, I thought it was still worth a shot. "I felt if I took the gamble and found some exposure online, I might be able to reach other Bad Dudes fans and form a tight relationship with them to help create a hilarious and over the top sequel that they all would love," he said. Bad Dudes 2 is looking for $80,000 and Modzeleski straight up admits the price tag is that high because of licensing costs. "A lot also comes from wanting to hire more staff to make this a fantastic game," he said. "We ant this game to stand on its own legs as a hilariously epic, testosterone-filled ride that players will want to play again and again because of awesome set pieces and combat mechanics." Though U.S. presidents usually don't license their inclusion in commercial works, as public figures they realistically can't or don't prohibit such appearances, especially ones that are plainly satirical. 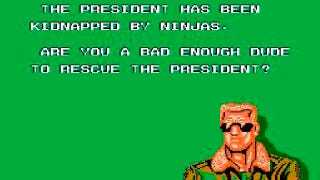 Bad Dudes may not have been that in intent, but its sequel will definitely pack on the irony. Asked if President Ronnie, the burger-loving Gipper-in-distress whom Blade and Striker rescue, would appear in Bad Dudes 2, Modzeleski said he "is referenced in name only. The current President will be featured," he added, "however it will be a character based on the current president, not actually that president in name." And that makes sense. President Ronnie didn't go by any other name in 1988, President Barry, or President Mitty, or whomever, shouldn't go by a real one in 2013. "I'm not really sure what else to say other than that," Modzeleski said. "I'm super passionate about it, I mean, I own a Bad Dudes arcade cabinet for a reason."